March to September – £125 per person. 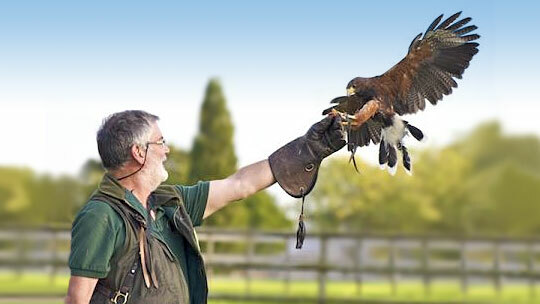 We fly a Barn Owl and two Falcons during the morning, which starts at 10am, then after lunch at a local hostelry, we fly a Hawk or two in some lovely Warwickshire countryside near Stoneleigh. We can assure you of a day you will not forget for a long time. Are you booking any of these days to give as a gift? We can send you a “Gift Letter” by attachment to give to the recipient. Please call 07956 377 859 to discuss or book. 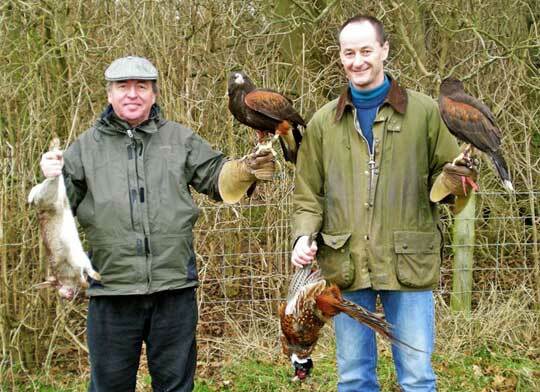 This is the traditional hunting season and a real hunting day where we take a small party out for the day and hunt Rabbit, Pheasant, and Hare with a team of Harris Hawks assisted by ferrets. The day starts with arrival at 9-30am. After a brief introduction over tea/coffee, we hunt in the morning up to lunchtime, when we have a light lunch at a local pub. We continue hunting in the afternoon, on a different part of our 1500 acre grounds, and continue until we lose the light. We then return to our cottage for and the day ends at about 5-30 pm. We explain the day as we go along, including field craft etc, and if we take quarry, which is most likely, we demonstrate how to prepare the catch for you to take home if you so wish. You then feed the birds and ferrets with their day’s final reward. This special day is a big hit with people who want to experience Hawk Hunting at its finest.